Anyone who knows the Munich startup scene and its events are probably also familiar the black mobile Barista Bar of the Münchner Kaffeerösterei (Munich Coffee Roastery). 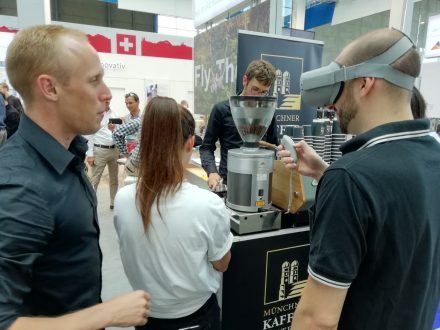 The coffee startup relies not only on traditional methods, but also on technologies such as artificial intelligence, virtual reality and blockchain. We spoke with its founders about their company and good coffee. What’s your favorite way to drink coffee? Black. Or with milk. Preferably hot. Or sometimes cold? Espresso? Or maybe from a French press this time? Coffee is and will always be a luxury food. Experimenting with different ways to brew it is loads of fun. There isn’t just one right way to make it. But for those who would like to delve into the more than 800 aromas that coffee has to offer, we would recommend going back to a French press or a hand filter. A sommelier’s recommendation: Let the coffee cool down a bit right after brewing and taste it without any milk or sugar. That lets your taste buds focus on the beverage as much as possible. Who are the people behind the Munich Coffee Roastery? What’s your story? The Munich Coffee Roastery is a true passion. With that passion but little experience in the industry, the four of us founders decided in 2017 to push the coffee industry ahead with innovative ideas and approaches. As a lean startup, we also wanted to find out what people really want now and how to reach these people best. Our knowledge from business consulting, psychology, sales, sociology and mechanical engineering allows us to look creatively at a traditional field of business. Now as graduate coffee sommeliers and coffee connoisseurs, we offer professional knowledge transfer from all aspects of our passion — good coffee. You call yourselves a coffee roastery, but what you’re predominantly known for in the Munich startup scene is your Barista Bar at nearly every major event. What do you offer, and why do you have such a strong presence in the startup scene? Coffee brings people together. Our innovative Barista Bar stands for genuine contact, progress and taking time for what’s important. At trade fairs, conferences and events, we bring visitors together over a cup of the best premium coffee. We can only solve the problems of our times together. Our mobile Barista Bar creates a meeting place that brings people together, reveals synergies and provides fuel for a successful event. Many of our current partnerships originated in the Munich startup scene, and we still feel very connected to it. Events like Bits & Pretzels, Medientage München and Digital Life Design (DLD) are now our partners and customers. You as a company are quite tech-savvy and use virtual reality, artificial intelligence and blockchain at the coffee roastery. How exactly do you use these different technologies? Our mission is to unite modern concepts with a traditional craft. Our goal: To motivate, inspire and find creative solutions to real problems with coffee. So why not start in your own market? Coffee is the second-most valuable commodity worldwide. Roughly one in seventy people across the globe make a living from coffee. Long trade channels and outdated trade patterns in coffee trade, however, lead to serious injustices, a lack of transparency and corruption. We want to change that with our Quality First Project: We already use VR technology to build awareness about quality aspects and the social responsibility for coffee as a product. Drinking a cappuccino side by side with coffee farmers — that’s something we offer our guests with VR at our Barista Bar at lots of events. We’re working on the next step right now — a transparent supply chain: Blockchain technology makes it possible to digitally map and clearly depict coffee’s value-added chain. Using AI-based sensor technology in countries of cultivation makes it possible to already validate the quality of the coffee while it’s being processed. Belief becomes knowledge — the quality and fairness of coffee becomes transparent. Cutting back on the number of middlemen and optimizing bureaucratic procedures means farmers will also end up with more money — and conversely, consumers will end up with better quality coffee. Which Munich cafés might we find you in when you’re not standing at your own Barista Bar? Munich has a lot of great places that offer a good cup of coffee. When we’re not standing at our own Barista Bar, we also like to get a cup of coffee at our first Munich coffee embassy at Smart Village. That’s also where we hold our coffee seminars.